UK publisher Com.x (45, BlueSpear, Seeds) next project is Monster Myths. 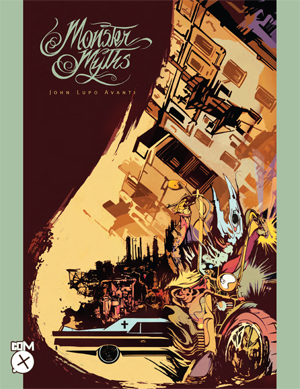 It’s in the current Previews catalogue (catalogue code APR120985) for release in June and is by John Lupo Avanti who has done work in the diverse fields of animation, tattooing and fine art. Here’s the official description. 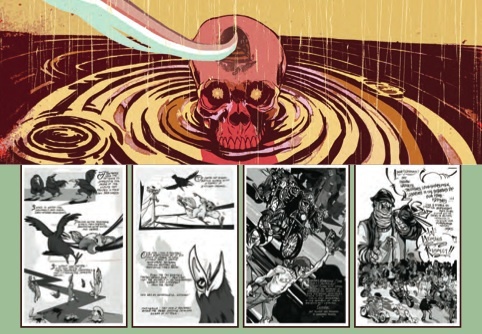 Monster Myths is a 120 page OGN, with black and white interior pages and a full colour gallery section. As a first time comics work with an intriguing plot and distinct visuals, this could be another winner for Com.x. Alfredo, a recovering felon turned working stiff, resides in Lower Scabo where working-class people live under the tyranny of the evil Cannibals Motorcycle Gang. After being beaten and left for dead by the gang, Alfredo decides to recruit a group of graffiti writers to instigate a war between the riff-raff of Lower Scabo and their neighbors in the well-to-do community of Northview. In doing so, Alfredo transforms from a two-bit perp into an iconic rebel, determined to free Lower Scabo from the control of those seeking power. An over-the-top, dark comedy pitching biker gangs against clean-cut, real estate developers and, in the middle, an unlikely hero stirring the pot in the hope of saving his neighborhood.